Today we’re happy to announce our upcoming two week Winter Sale! From December 12th until December 26th, we’re offering 25% or more off on select titles! Come celebrate the holidays with some of the finest games we have to offer! 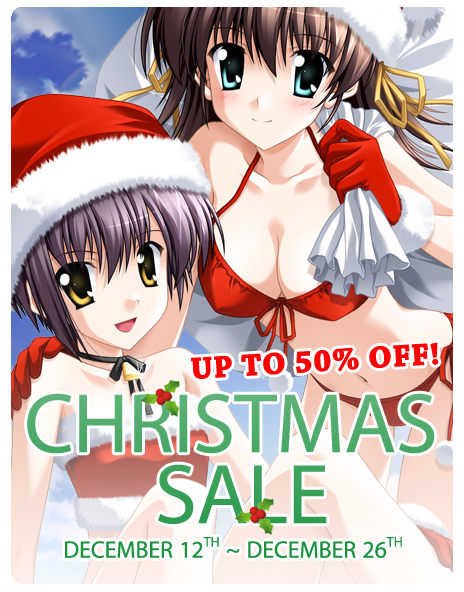 Hardcopies are on sale too, so you can buy some of our great games as gifts for your friends! Check the full list after the break! Da Capo (and hardcopy) 25% OFF! Da Capo 2 (and hardcopy) 25% OFF! DEARDROPS (and hardcopy) 25% OFF! DEARDROPS & d2b Bundle 25% OFF! Demon Master Chris 25% OFF! ef – the first tale 25% OFF! ef – the latter tale 25% OFF! Go Go Nippon (and hardcopy) 45% OFF! If My Heart Had Wings 25% OFF! Kara no Shoujo 25% OFF! Kira Kira Bundle 25% OFF! Kira Kira (and all-ages version) 25% OFF! Kira Kira Curtain Call 25% OFF! Koihime Musou (and hardcopy) 25% OFF! Shuffle (and hardcopy) 25% OFF! World End Economica 40% OFF! Tagged Baseson, Caramel Box, Chou Dengeki Stryker, Circus, d2b, Da Capo, DEARDROPS, Demon Master Chris, ef, Go Go Nippon, Harukoi, If My Heart Had Wings, Innocent Grey, Kara no Shoujo, Kira Kira, Koenchu, Koihime Musou, minori, MoeNovel, Navel, OEL, OtoBoku, OVERDRIVE, Sale, Shuffle, Soul Link, Suika, Tick Tack, World End Economica. Is the blog pic part of ef art book that will come in the limited edition? Is there any chance the patch of Cho Dengeki Styker will go on sale, or am I SOL? Does anyone know if old visual novels like Kira Kira or Da Capo run on Windows 8 64 bits? Please don’t sell “If My Heart Had Wings”, this is a totally butchered version with 50% of images removed or edited and with heavily edited and incorrect translation. I think that ship’s already sailed, son.